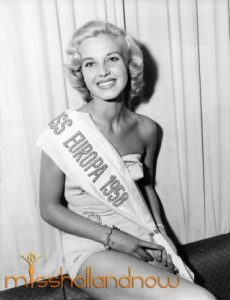 The Netherlands participated, after world war 2, in beauty pageants since 1949 when Mary Jochemsen represented our country at the Miss Europe pageant. The first years Miss Holland wasn’t very successful at the international stage of beauty pageants but in 1956 that changed when Rita Schmid became the first dutch woman to be a finalist at the Miss Europe pageant. 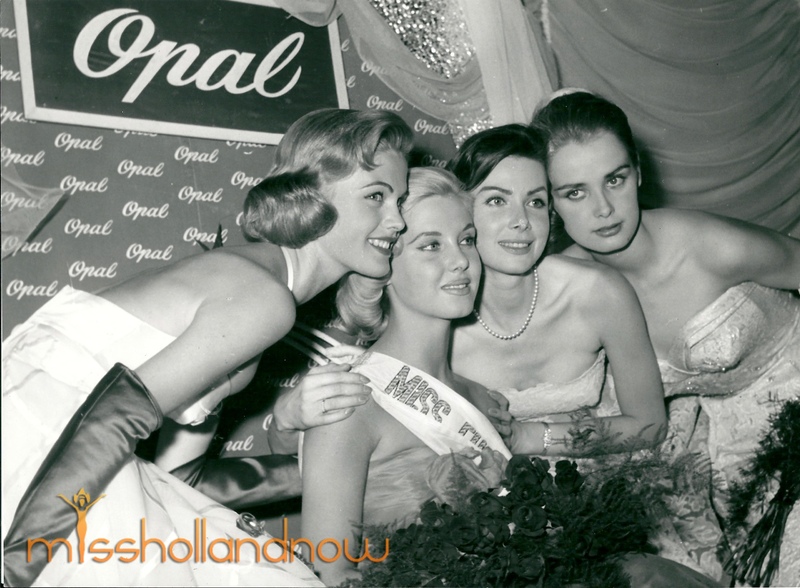 After 1956 it seemed that the Miss Holland committee had found its formula, in 1956, 1957 and 1958, Miss Holland was typical blond dutch blond girl and all three did a great job at the international pageants. Just 17 was Corinne Rotschaeffer when she was crowned Miss Holland and a few weeks later she also won the Miss Europe pageant in Baden-Baden, Germany. Her first runner-up was Miss Finland, Marita Lindahl who would win the Miss World pageant later that year. Corine would win the Miss World crown two years later in 1959. Miss Germany, Gerti Daub, 2nd runner-up and Miss England, Sonia Hamilton, 4th runner-up, would both represent their country at the Miss Universe pageant and were both finalists. Miss France, Geneviève Zanetti, who ended in 4th place, did not compete in any other pageant. She was an actress who played in two french movies. Because of her busy schedule as Miss Europe, Corine was unable to attend the Miss Universe pageant in that year but she would go one year later in 1958 when she placed as semi-finalist and winning the Miss Photogenic title. Funny detail: Corine can be seen in both program books of Miss Universe 1957 and 1958. In 1957 she was not replaced by any other beauty queen to represent the Netherlands at the Miss Universe pageant. One more detail, although on the sash it says Miss Europa 1958, she really is Miss Europe 1957. It says Europa because thats the german way to say Europe.